Evangeline O’Neill’s parents just can’t handle their boisterous daughter any longer. She drinks (to the health of Prohibition, whenever she can), she stays out too late, and she spills the beans about one of Zenith, Ohio’s golden boys during a psychic party trick. Evie is exiled to New York into the hands of her Uncle Will, who runs The Museum of American Folklore, Superstition, and the Occult (also known as the Museum of Creepy Crawlies). It turns out this is not such a bad punishment: New York during the Roaring Twenties—the city of speakeasies, flappers, shopping, movies, and theaters. Evie’s new life is the elephant’s eyebrows, the cat’s pajamas. Uncle Will is a benignly negligent guardian who asks little of her. Soon Evie is out partying with a Ziegfield girl and her friends and making the rounds of New York’s jazz clubs. But Evie’s life comes unglued when the New York police consult Uncle Will about a brutal murder. She accompanies him to the murder scene which has occult overtones: an inverted pentagram branded on the dead girl’s chest, and an odd note ranting about the Harlot, the Beast and the fifth offering found nearby. Evie picks up the girl’s shoe buckle and tries to reattach it, wanting to correct this small indignity. Images of the dead girl’s life and her final moments of horror flood unbidden into Evie’s mind. For Evie is a diviner, someone who can “read” objects belonging to people and learn about their secret lives. Evie never talks about her power. It scares her. When she did the reading in Ohio, it was a mistake she doesn’t want to repeat. But when the second murder surfaces, and then a third, she realizes she can use her power to help catch the killer, if she can convince Uncle Will to let her, and if the killer doesn’t get to her first. There’s a sense of impending doom, a gathering of characters for an apocalyptic confrontation between good and evil. The reader can all but see the roiling black clouds piling atop one another in the distance. It’s like the Great Gatsby meeting Hannibal Lecter, or Stephen King meeting, well, Libba Bray. This is the first of a planned trilogy: a big book, not just in size but in scope and concept. The story sprawls across time and place, putting us into the minds and lives of not only Evie, but the cast of the other paranormally talented people who will help her in the epic battle against a terrifying villain. There’s Sam, who tells people not to see him—and they don’t. Memphis the healer, and his little brother Isaiah who sees the future. Blind Bill, Miss Addie, and Miss Lillian. All have their own special powers, but not all of them are who they seem to be. Evie is a realistic and likeable heroine, sassy one minute, scrappy the next. The quirky secondary characters—including the dilapidated death house—are vividly rendered. The complex plot is intriguing and engages the reader as it weaves its way through the pages of this brilliant book. 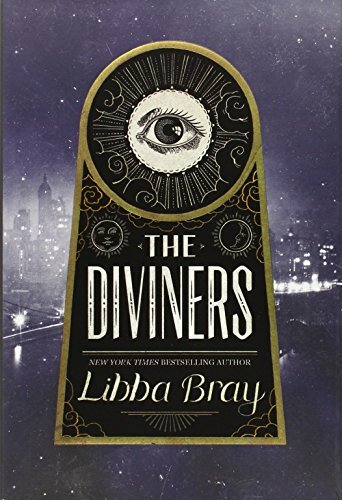 Libba Bray has created a mesmerizing concoction of the paranormal mixed with horror, well seasoned with captivating period detail. The giddy exuberance of the Roaring Twenties thumps up against an increasingly threatening atmosphere in which an ancient evil arises from the dead to take over the world and remake it in its image. The sparkling setting and the darkly sinister atmosphere combine to make a veritable chiaroscuro best savored in long sittings under a good reading light. Be sure to lock the doors first; you never know what wants to get inside.